In the past weeks there have been a number of articles heralding the new USD bull market (that will happen after 6 weeks of strong gains, especially versus the EUR, its primary trading counterpart). However it’s important to distinguish between the kinds of positive US economic data that are bullish for the USD and the kinds that are not. Currencies move first and foremost with interest rate differentials, or expectations about them. In other words, if markets think the benchmark rates of the USD will be rising relative to those of the EUR, then the USD will appreciate versus the EUR. Currencies with higher rates appreciate in times of optimism, and are sold in times of pessimism. In recent years the EUR enjoyed the advantage of higher rates and expectations of continued higher rates. Therefore the EUR was more in demand during the rallies that have occurred since markets bottomed in early 2009. This general tendency was especially true for the EURUSD. For most of the time since the Great Financial Crisis (GFC) hit, good economic news for the US or global economy in general did not indicate better US jobs or spending, and so investors bought the higher yielding EUR and sold the lower yielding USD. The only times when the USD moved higher was in times of great fear, when such trades are unwound and USD demand would spike, somewhat like demand for heavily shorted stock increases as short sellers need to purchase it just to cover their bets against it. As I’ve noted regularly in past articles and comments, the EUR and USD tend to push each other in opposite directions, like children on a seesaw. Here’s a simple explanation. The EURUSD is the most widely traded currency pair, accounting for a bit less than a third of all forex trade. For the purposes of illustration, let’s assume a third, to keep the math easy. Every time 6 Euros are bought, 2 US dollars are thus sold, and vice versa. The Fed has long made clear that it’s most concerned about employment and consumer spending. Only when these improved significantly would it consider raising rates and moving away from its ultra-accommodative loose money policies. US data. Over the past months US jobs and spending data, while not great, has beaten modest expectations, and certainly outperformed that of the EZ, especially once you strip out Germany. The US has been making progress on these metrics, so data has favored the EURUSD. Besides news that raises hope for US benchmark rate increases, the only thing that has supported USD rallies has been rising fear, because the USD’s low rates made it a safe haven currency, that is, a currency that was in demand only in times of fear. The ‘best’ kind of fear for USD rallies was EU-crisis fear, because it brought EUR selloffs. As noted above, if investors are selling the EUR, they are buying the USD. So EU fear was a double bonus for the USD, just as EU optimism was a double-whammy for the US dollar. The recent political uncertainty over Italy has raised concern about too-big-to-fail-or-bail Italy, as shown by recent weak Italian bond auctions. Currently the parties getting the most support are the ones running on platforms markets fear most – abandoning austerity and possibly, leaving the Euro-zone. These are the two big recent drivers of the EURUSD. In addition to Italy, Spain and Greece are in deep recession, and even France, Holland, and Belgium are struggling along with the GIIPS nations . That leads markets to suspect new ECB easing is coming. Meanwhile the Fed is not expected to ease monetary policy further. On the contrary, as long as US data doesn’t deteriorate, the Fed is not expected to ease further. So at minimum the ECB is easing relative to the Fed. If US data continues to improve, as markets expect it will, then the Fed is expected to make some tentative steps to cut back on its ultra-loose, USD dilutive policies. So market expectations favor the USD. Wednesday: FOMC meeting, rate statement and press conference. This provides the latest clues about whether the Fed is considering changes. None expected at this time. Thursday: We get a big batch of EU service and manufacturing data that provides the latest look at its economic health. There is also the US Philly Fed manufacturing index. Negative EU data combined with a positive US Philly Fed report would reinforce the bullish USD sentiment, or bearish EURUSD sentiment. Rising risk appetite still tends to favor the EUR (and hence the EURUSD) as long as there isn’t new negative news about the Euro-zone, or positive news specific to US jobs and consumer spending. Therefore the ongoing rally in stocks and other risk assets will be supportive of the pair. 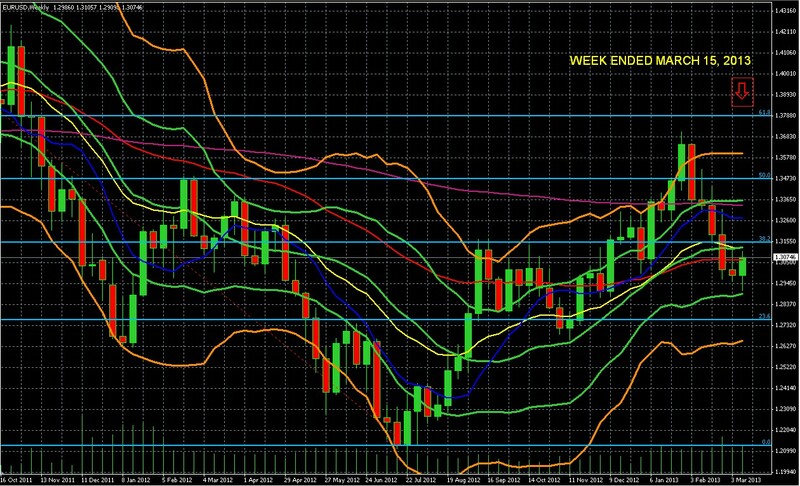 Looking at the weekly EURUSD chart below, just a few points. The pair bounced at the strong support of its 50 week exponential moving average (red line), closing just above it after a 5 week drop of about 700 pips or 5%. The pair is firmly in the neutral zone of its double Bollinger bands, suggesting that there is neither up nor down momentum. See here for a quick explanation of how to use and interpret double Bollinger bands. Thus barring any big surprises from the EU or US, the pair is likely to stay in a narrow trading range. This lack of clear trend is also suggested by the flat 10 (blue), 20 (yellow), 50 (red) and 200 (violet) week moving averages (EMAs). Reminder to anyone with most of their assets linked to or denominated in either the USD or EUR (ok, the JPY and GBP too). These currencies are either being actively debased (USD), about to be (JPY) or at high risk of being subject to new easing that risks loss of purchase power (EUR, GBP). 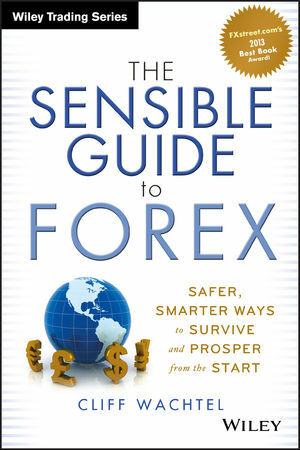 See here or here for information on my book, written specifically for those seeking safer, simpler ways to diversify into assets linked to healthier currencies.